I went to see the latest installment in the Hunger Games series on Saturday. I love, love, love these books and the first movie had been very well done so I was super excited to go see this. It had received rave reviews and I was not disappointed. The acting was excellent on all fronts, they stayed very true to the book and the special effects were fantastic. I probably don’t need to sell this movie too much, many people already are wanting to see it and have been. If you were on the fence though though, go see it in the theater. Also, if you haven’t read the books, do that too! These books are really easy reads. In preparation for the release of catching fire I re-read the book. One thing that I’ll note is that when I read the books I was totally team Peeta. 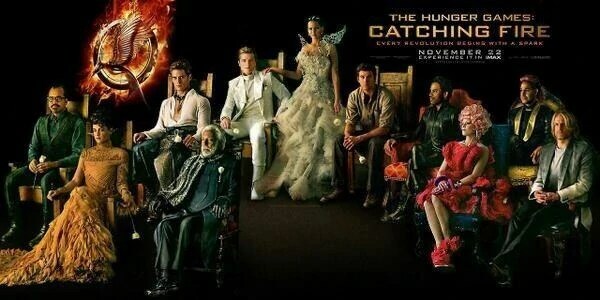 After seeing the first movie, I started to kinda go, well, Gale wouldn’t be bad. After this one, I appreciate Gale even more. I’m still team Peeta, however, I get the appeal of Gale. Maybe it’s because a Hemsworth is playing the part! I love the addition of the new characters in this installment. Finnick (Sam Claflin) and Johanna (Jenna Malone) are awesome, they both had some scene stealing moments. The returning characters were also fantastic. I always enjoy seeing Lenny Kravitz on screen as Cinna. Woody Harrelson as Haymitch, Elizabeth Banks as Effie, Stanley Tucci as Caesar and of course the trio, Josh, Liam and Jennifer (Peeta, Gale and Katniss). All together, these folks really pulled it off. One thing I will say is that if you haven’t read the books, the ending of this movie may seem unsatisfying. I heard some people leaving the theater saying that they didn’t like how it ended, but it ended exactly as it did in the book. It is really important to the overall story but like most middle books, it’s a means to an end. Again, go see this movie, it really was very good. In case you didn’t know, they are breaking up the last book into two movies (of course they are, they know people like me will go out and see both). The next one is due out in 2014 and the last installment in 2015. So not too long to wait! Last Saturday we celebrated the birthdays of two of my good friends, Julie and Sarah at one of my absolute favorite restaurants in Pittsburgh, Legume. This amazing restaurant is on Craig Street in Oakland. Their menu changes each day, but usually you can find some of the same things throughout a given week. This is a family run restaurant and from what I’ve heard, they are very involved in the community and are very committed to making sure what they serve is fresh. We started in their bar, Butterjoint. It’s rather small and they have their own small menu. I’d like to go back there on a night when it isn’t so busy to eat, we could barely find a spot to stand while we were waiting for our table. Luckily, we were seated right on time. I’ve been to Legume two or three times before but it had been a while, so I was really happy to get back there. We started by sharing some cheese. We got the Raclette, which has a consistency similar to Brie. We also ordered blue cheese with a pear compote. I personally liked this best, the flavor of the blue cheese with the sweet compote was an awesome pairing. For my main dish, I struggled with what to order. There was a lamb dish that sounded great (and I got a little bite of it, it was done in a Mediterranean style and there was a hint of cinnamon, I really liked it). But I went with a bluefish dish because I’ve heard that they are very picky about their seafood and they get it daily, so I figured it would be the thing to try that night! 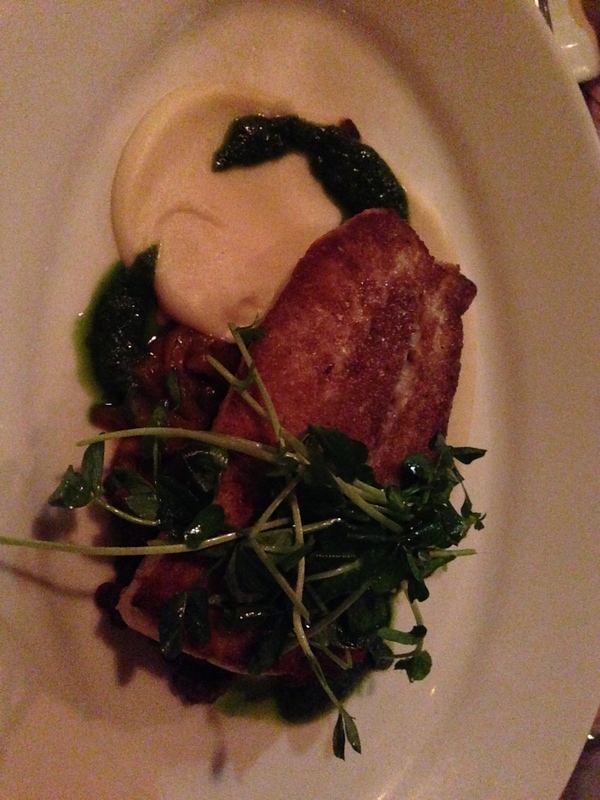 The fish was a little crispy on top and was served with lentils and a sunchoke puree. It was fantastic and I literally ate every bite. If it wouldn’t have been very bad form, I would have licked the plate. 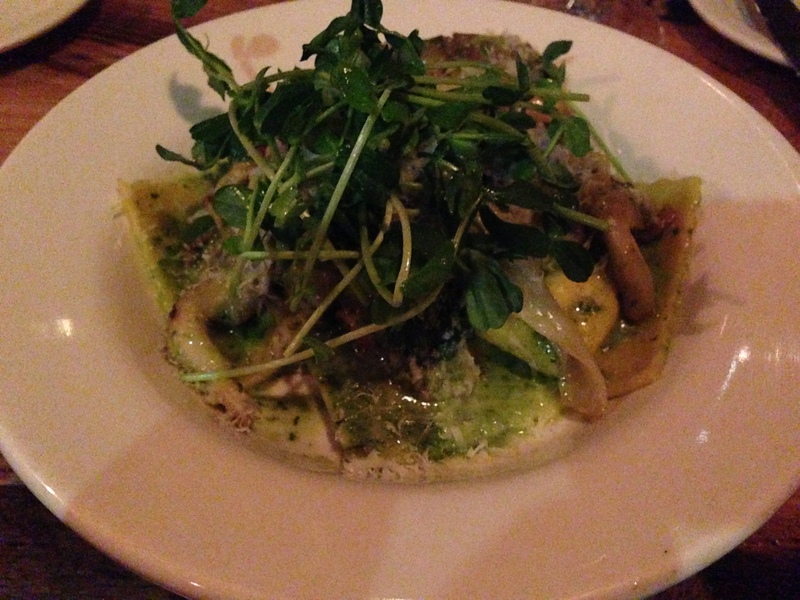 Several of my friends ordered a house-made ricotta ravioli that I, of course, needed to try! Look at how pretty that was. It was served with an arugula pesto which gave it a slightly different flavor than what I’m used to with pesto, but I liked it, it was kind of refreshing. The ravioli was really good too. There is just something about fresh ravioli, it tastes so much better than frozen. I don’t realize the difference until I get some fresh ravioli. Since it was a birthday celebration, we obviously ordered desert! There were seven of us at dinner and we were debating what we should order, there were four options. So we did the logical thing and ordered one of each to share. I only nabbed pictures of two of them. 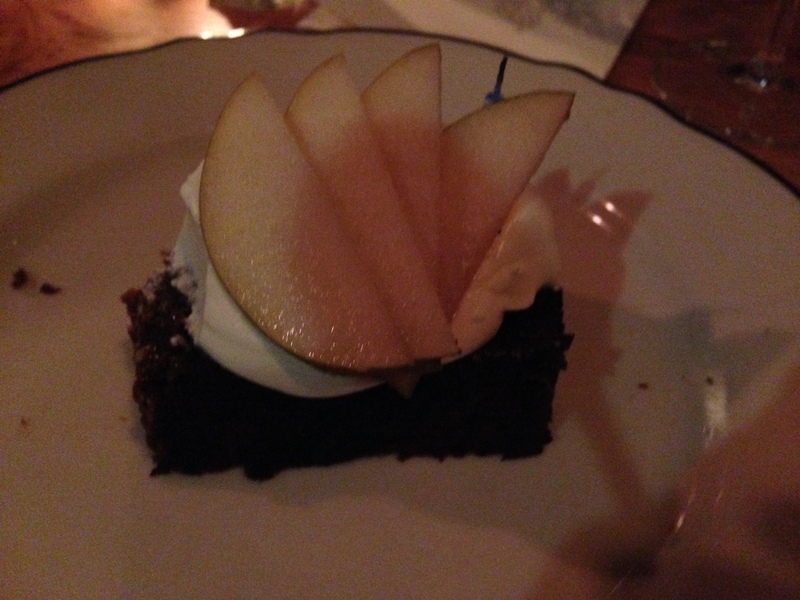 The gingerbread cake… gingerbread usually isn’t my thing but I really enjoyed this. 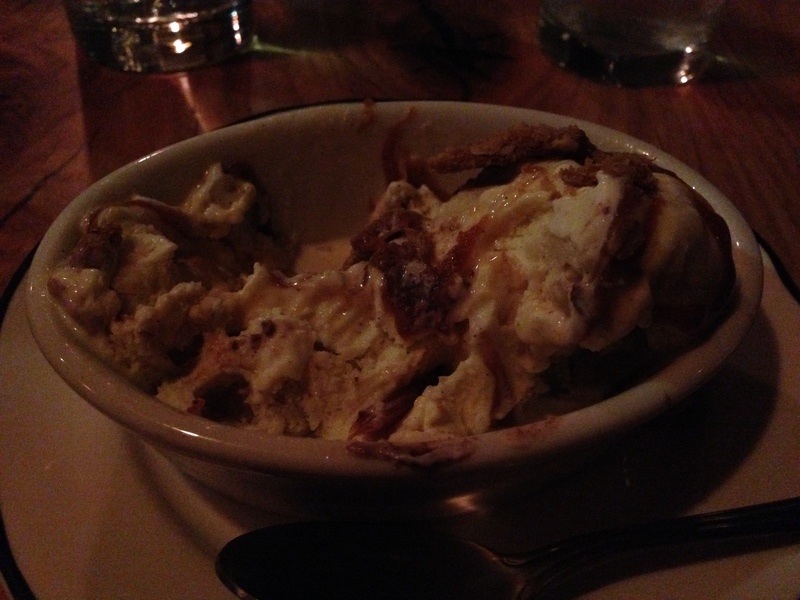 And the apple pie ice cream, which was so good, I think it was my favorite of the four. I mean it was apple pie in ice cream form, what could possibly not be awesome about that. I know, bad picture, remember, I don’t want to be the annoying person in the restaurant so I keep the flash off! We also ordered a chocolate cake that was very rich, but also very tasty. There was one other desert that I can’t recall the name of. It was fluffy and sticky and awesome and I’m really sad that I didn’t take a picture of it. If Niki reads this I’m going to beg her to write in the comments on the blog what it was! I hope she remembers since she ordered it. So, as usual I had an amazing meal at Legume. They put together a great menu each day and I always look forward to visits to this restaurant. I’d highly recommend it if you haven’t been there yet. I’ve been to Round Corner Cantina many times before, it’s one of my favorite places in my favorite neighborhood, Lawrenceville. 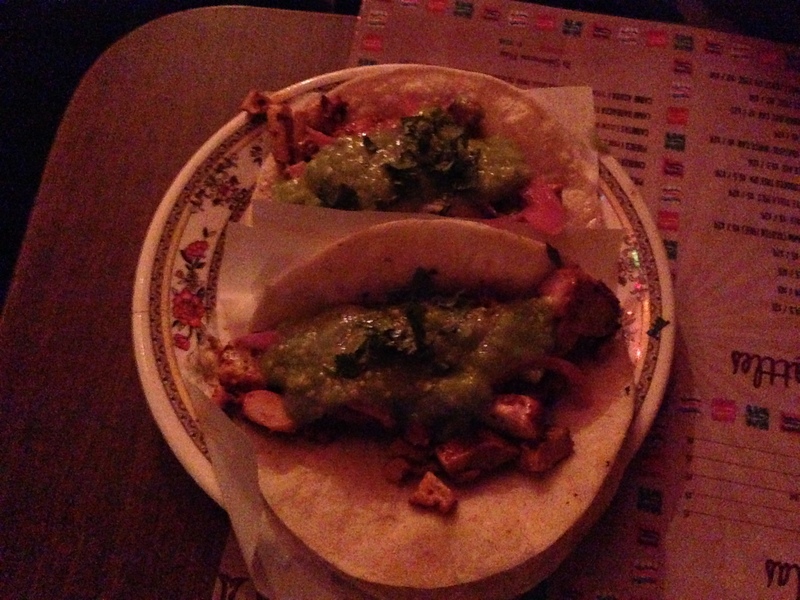 It’s a tiny bar that serves good tacos and excellent guaqamole. When the weather is nice, you can sit outside in their courtyard. I was first turned on to this place by a friend of a friend who was from Arizona. He said that this was the only decent so-cal style Mexican food that he’d had since moving to Pittsburgh. According to him, it wasn’t perfect, but it was close. Jen was craving some Mexican tonight so we decided to go back to this favorite place. I’ve tried the mahi mahi, the pork belly, the carne asada, the chicken and now the lamb tacos here. I’ve enjoyed each and every one of them. As you may already know, I hate turning my flash on in restaurants, so I apologize for how dark everything is! And their guaqamole is one of my favorites. It’s super simple, just some lime, salt and pepper, cilantro and some other seasoning (probably chile and cumin). They serve it with homemade chips that are awesomely salty and fresh. I had to have a margarita tonight also… okay, I had two. It was a two drink kind of night, what can I say. I needed to get some stuff off my chest, and Jen’s the person that I can do that with. Thank you Jen. 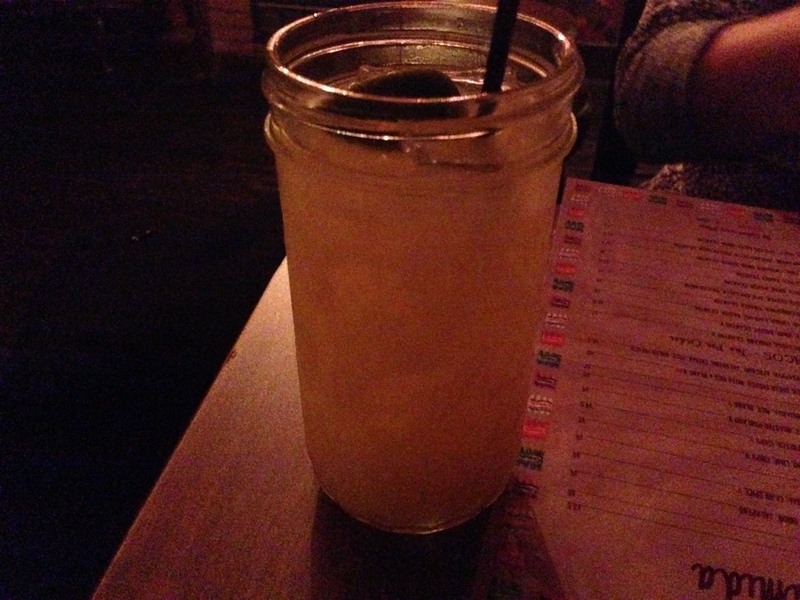 I love how they serve these, the mason jars are a nice touch. They are really fresh tasting. I have to say, I probably enjoy these more when the weather is warm, but I’ll take a good margarita any time that I can. This really is one of my favorite places to go to. 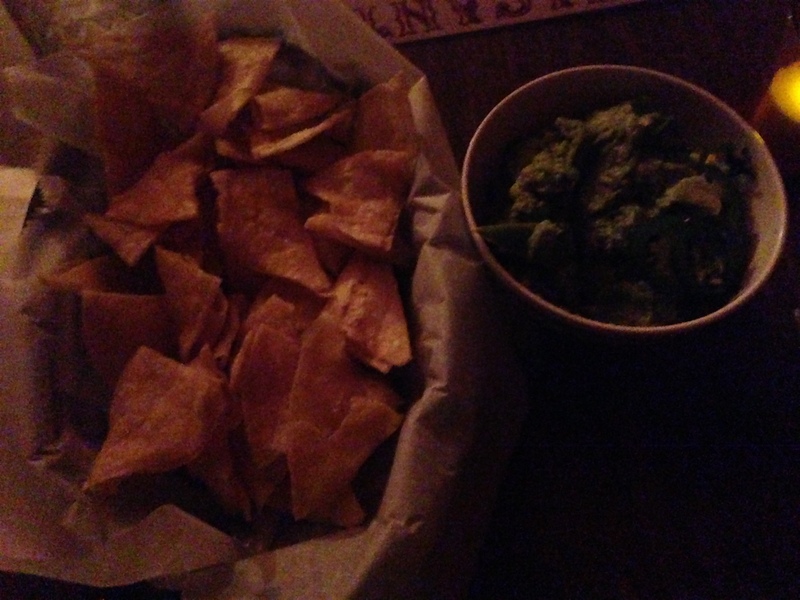 If you are looking for some good tacos and guacamole around Pittsburgh, I highly recommend Round Corner Cantina. Did you know that the name of this blog is Dinner and a MOVIE? Yea, I was focused a lot on the dinner part and not so much on the movie part lately. Anyway, I went to see Ender’s Game tonight! I’ll state for the record that I really enjoyed this movie. A lot. If you are a reader and enjoy sci-fi, please go read this book right now. It’s long, but please, I beg of you, read the book before you see the movie. Granted, as usual, the movie is not as good as the book, but they preserved the most important elements. Also, Asa Butterfield’s performance for me was spot on. In the book, we see Ender progress from about 6-7 years old through about 12. In the movie, that would obviously be difficult, so he’s more in the 12-13 range in the movie, at least that was my take on the age. I was a little peeved that Harrison Ford got top billing for this when Asa was the star, but hey, a studio is going to do what they think will put the most butts in seats. I’m going to get a little specific here about the story line. So if this is a movie/book that you don’t want spoiled, move along, come back later! The premise of the movie is set in a future where many years prior to Ender, the Earth was attacked by an alien race called the Formics. They nearly defeated us but for the brilliant commander Mazer Rackham. While the Formic’s have not since attacked, we are at the ready and are in fact advancing on their home planet. The International Military has decided that the youth of the Earth are the best suited for command of the fleet as they have grown up on massive video game simulations, and they have been searching for a commander for the final attack. Those chosen to advance through the military go to Battle School and if they cut it there, they go on to Command School. As the movie opens, it stays rather true to the book. We’re introduced to Ender immediately and also get quick look into his psyche as well as the motivations and mechanisms of the adults who will attempt to control and maneuver Ender throughout the movie. Harrison Ford’s character, Colonel Graff, is also introduced to us immediately. One of the things I was glad to see was that they didn’t completely write off Ender’s siblings, Peter and Valentine. Peter is brilliant but a psychopath who terrorizes Ender while Valentine is his protector and closest friend (and in the book, also brilliant). In the book, Peter and Valentine get a whole sub-plot that is rather complex and interesting. I understand why it was cut from the movie, it would have added about another hour to it! Ender leaves his family to go to Battle School. One of the things I was most impressed with was how the special effects team created and laid out the battle game room. I had a vision in my head that Orson Scott Card (the writer of the book) had created for me and this was basically spot on. I loved it. In the book, we see Ender progress quickly through battle school. In the movie, it was even more rushed. But we have to get him ready for Command School! Throughout battle school, you can see Ender’s struggles. He has a violent side that he tries to suppress, but when pushed, it comes out. And people do like to push Ender. Ultimately, Ender of course ends up in Command School, surrounded by his most trusted team from Battle School. Here, he meets the great Mazor Rackham and begins to try to understand the enemy. They are called bugs by the humans because of their appearance. Also, because of how they behave, they essentially have queens who command drones, kill the queen, and the drones stop and die. This is when Ender begins to command simulated battles. I’m about to get REAL spoilery here, so if you don’t want to know how this movie ends, again, LEAVE. In the book, this came as a complete and total shock to me. In the movie, I’m not sure… I obviously knew how it ended, but I think they gave more hints than were in the book. Anyway, Ender and his team only believed they were simulated battles. in reality, each battle was real as fleet moved closer and closer to the Formic home planet. On the day Ender and his team believe they are graduating from Command School, they have a large audience watching the battle. Ender ultimately destroys and entire planet and wins the war. His realization that it was not a simulation but a real battle is horrific. He’s committed genocide on the largest scale, eliminating an entire race. Imagine coming to that realization after the fact. When I read the book, I wanted to cry at how children, specifically Ender, were manipulated by adults. The web of lies was so grand, it was astonishing. Throughout, the idea that it was “for the greater good” was said over and over again in different ways. Ender, wise beyond his years, questions everything from their methods to his own. Could peace have been negotiated. Could they have communicated with the aliens (they had no vocal cords, so communication seemed out). Could he have done something different during the final battle to save more humans in the fleet and the home planet of the Formics. Graff tells him no, that if Ender had known it was real he wouldn’t have been as daring, and ultimately would not have been successful. Ender will never know, but he will have to live with what was done. Ultimately, in both the book and movie, there is one queen left and Ender goes off to find a new home for her in an attempt to make things as right as they can be. So, again, I really enjoyed this movie. I felt that the performances were well done and they stayed rather true to the book. There were things that would obviously be left out due to time constraints. I would recommend this movie if you are a fan of the sci-fi genre. Seriously though, don’t wimp out, read the dang book! I know, some of you aren’t readers and that’s asking a lot, so fine, just go see it! Has anyone out there also seen it? What do you think? How did it compare to the book for you?